In acceleration every motorcycle moves its weight to the rear. As the rear suspension gets to carry a higher load, it is normally travelling down. We call this Squat. Under acceleration however there are much more forces working, that make it not so predictable if your rear suspension moves up or down during acceleration. Besides the simple load transfer, there is another reason for most bikes rear suspension to Squat under acceleration. Consider the pivot point of the rear swing arm as the points where the forces work around. The chain is running above the swing arm pivot point. When the chain it is pulling, it tries to squat the rear suspension more. 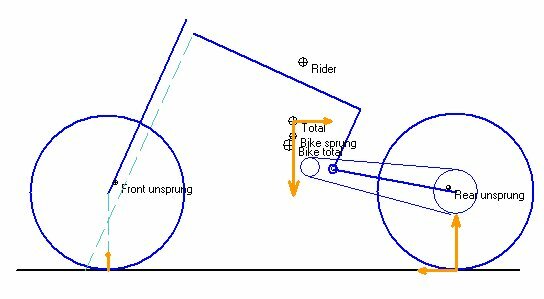 Parameters that influence the squat by the chain are the distance of the chain to the pivot, and the final gear ratio that changes the actual force in the chain. The anti squat of a motorcycle is caused by the swing arm suspension system. The rotational point of the swing arm is above the point where the motorcycle drives itself (the ground!). This height difference and the driving force will create a torque that tries to push the rear suspension out. Some bikes have so much anti squat that the rear suspension almost fully extends during acceleration. From riding a motorcycle it is difficult to judge if it has a tendency to squat or anti squat. Many racing bike tend to be quite neutral. In this area the balance is very delicate. In racing the changes made to the pivot point height are often 2 mm maximum. For more grip normally higher anti squat is used and we go the other way with less grip. However geometry software like SuspAct is needed to oversee the complete picture of this. The squat or anti squat behaviour depends on many parameters like: Swing arm angle, Rear ride height, Swing length, Shock length etc… In our software these parameters are all combined so you can worry about other things.